Ah, barbecue. A party staple that has transcended geography and time. When you come to think of it, grilling meat might have been one of the earliest techniques of cooking because of its sheer simplicity. Over the years, meat connoisseurs introduced culinary innovations to the barbecue—so much so that we now have a whole spectrum of choices in terms of cooking style, ingredients, and taste. The barbecue cooking technique has also been applied to all sorts of meat—pork, beef, chicken, lamb, and so on. There’s a barbecue variant for every preference. The non-pork options, in particular, can be enjoyed as savoury halal treats. To recap, halal is what’s permissible for the Muslim community to use or consume according to the Islamic law. But everyone—even non-Muslims—can enjoy halal food. In Singapore, where eating is a favourite pastime, barbecue restaurants have popped up practically everywhere. Foodies roam around in search of new ones to try and old ones to go back to. Craving now for some charred and juicy barbecue meal? Here’s a list of some of the best spots serving halal barbecue in Singapore. Sometimes, all we want is a great mookata. Say no more lah, as Chickata Makan Place already awaits you and your halal cravings. Foodies will love this new halal bbq place in Jurong East for being easily accessible. As you arrive, on deck are a variety of marinated chicken, beef, lamb, seafood, and vegetables partnered with delightful homemade chili sauces that will enhance your barbecue experience. 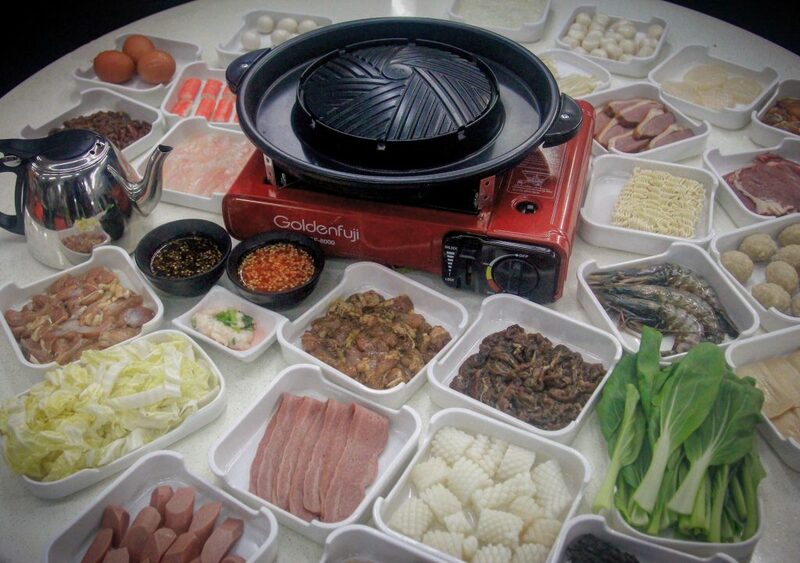 They offer set menus for big groups, as well as steamboat and barbecue combo platters that you can mix and match. Meanwhile, if you want to share this satisfying makan experience with your loved ones, gift vouchers are also available so you can give them away for their Hari Raya feasts! Chickata BBQ is located at 326 Jurong East Street and is open from 3 p.m. until 11 p.m. on weekdays and 11 a.m. until 11 p.m. on weekends. Go to their Instagram page and check out their sumptuous meals! Call +65 8440 4938 if you have more questions. Just how does this pagoda work? Well, the top tier is a steamer. The second tier is filled with a variety of dips to enhance the food’s taste. The third is for the barbecue hotplate, while the last one is for the soup base. The pagoda is quite similar to the mookata, which allows foodies to grill, steam, and boil marinated meat, seafood, and vegetables all at the same time. Avail of Flame Cafe’s Deluxe Buffet and choose from over 70 food items, including tiger prawns, marinated meat, sliced beef, and lamb with unlimited ice cream and free-flowing Thai iced tea for only S$19.90 during weekdays and S$21.90 on weekends. Enjoy 20% off all items from Flame Cafe from 10 p.m. to 2 a.m. on Fridays and Saturdays, and 9 p.m. to 11 p.m. on all other days. The restaurant is located at 73 Upper Paya Lebar Road, Centro Bianco (just a short distance from Tai Seng MRT) and is open from 10 a.m. to 2 a.m. Visit their Facebook page or call +65 6288 6346 for more of their promotions and store announcements. Located at the heart of Zion, this family-friendly, halal bbq joint serves an extensive selection of Indonesian dishes. You will be transported to the Indonesian archipelago when you try the restaurant’s charcoal-grilled meat skewer called sate ayam madura, ayam bakar kecap (which is the IndoChili’s version of juicy chicken barbeque), grilled snapper fish called ikan bakar Bali, as well as their combo bakaran (which is a combination of grilled black pomfret), squids, prawns, satay, and chicken. IndoChili is located at 54 Zion Road and is open from 11:30 a.m. to 10:00 p.m. on Fridays and Saturdays, 11 a.m. until 10 p.m. on other days, and closed on Tuesdays. Reserve a table a day in advance as the place gets filled quickly. You may also call their hotline at +65 6445 1766 and you’ll be assisted by their friendly staff. You can also check out their Facebook page. 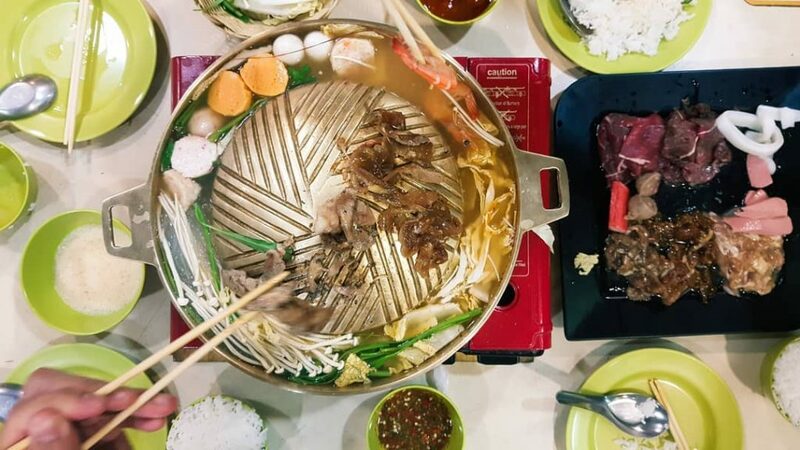 Situated at Satay by the Bay, the Marina Bay BBQ Steamboat Buffet is a nice spot for you to recharge after touring some vacationing friends or family around the Marina Bay and Esplanade area. 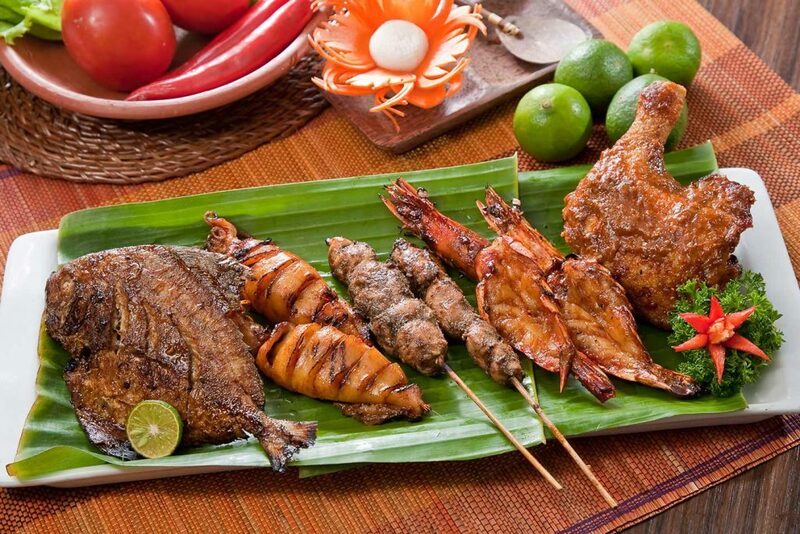 Choose from over 80 types of food, including marinated meat and fresh seafood for you to grill in a breezy, al fresco setting. Complement your meals with free-flowing soda and unlimited ice cream. People are often surprised to know that this Marina Bay spot is actually not that pricey. From Mondays to Thursdays, adults pay S$27 nett while kids aged seven to 12 years old pay S$15 nett. Meanwhile, on Fridays, Saturdays, and Sundays, adults pay S$29. On the eves of public holidays and holidays, adults pay S$30. Kids pay S$15 nett for all days. Moreover, kids below seven years old can eat for free, provided that he or she is with one paying adult. Take note that each paying adult will be entitled to one child (below seven years old) eating free. 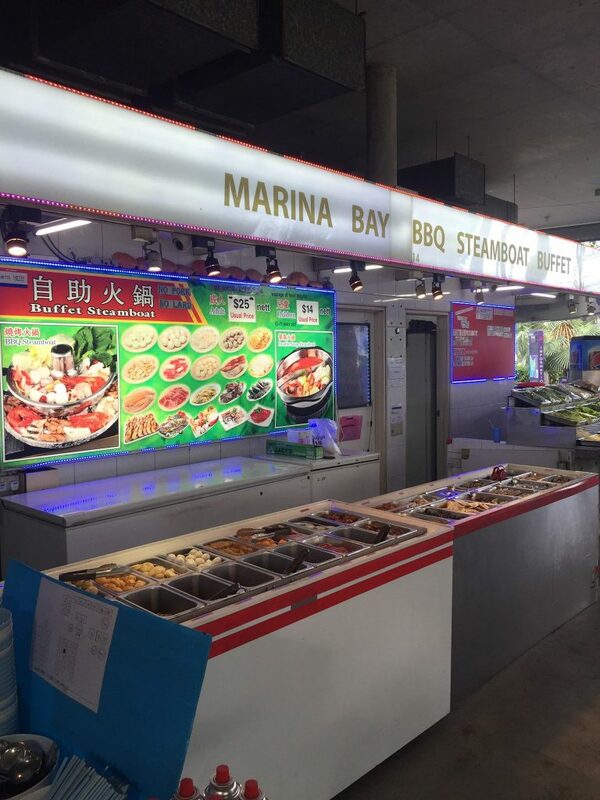 Marina Bay BBQ Steamboat is at 18 Marina Gardens Drive (Satay by the Bay) and is open every day from 5 p.m. to 12 midnight. Call +65 9131 1272 for inquiries. You can also check out their Facebook page. Penang is a state in northwest Malaysia, popular for its delectable cuisine. Fortunately for us locals we can enjoy Penang cuisine anytime. Located in Causeway Point, Penang St. Buffet is the first Penang-themed halal buffet in Singapore. Though it’s known for its all-you-can eat crabs (yes, ALL CRABS!) offer, it’s also an amazing place to get your fill of grilled seafood. You can choose from their delicious spread of fresh lobsters, live oysters, scallops, green mussels, and many more. Shiok! 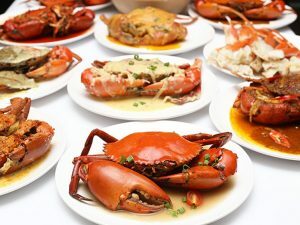 While you’re there, try their scrumptious crab dishes as well, which include stuffed chicken in crab, crab bee hoon soup, seafood roll, and chili crab spaghetti. You can go online (email reservations@gdgroup.com.sg) or call (+65 6894 7872) Penang St. Buffet to make reservations. They advise customers though to make reservations online as they get a lot of calls during peak hours. Penang St. Buffet is located at Causeway Point #05-12/13, 1 Woodlands Square. The MRT station nearest to it is the Woodlands station. The word “sedap” means tasty in Malay. And boy, this halal restaurant is true to its name! 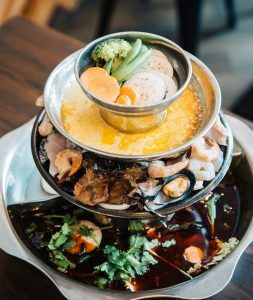 Sedap Thai is a halal bbq joint that uses beef fat to grease the skillet. They have a la carte items on the menu, but longtime patrons recommend that you get their platter set, which comes with 15 different items including vegetables, meats, and seafood as well as prawns, crab sticks, beef balls, and chicken balls. Sedap Thai offers two options for the chili sauce—one is herby and tangy, while the other one is a thicker red chili paste with a sweeter taste. They also have a steamboat section. Sedap Thai is located on the first level of Berseh Food Centre and is open from 4:30 p.m. to 9:30 p.m., Mondays to Saturdays. Check out their Facebook page for more information about the stall or call +65 8298 3579. Halal BBQ At Home? Oh Yes! Have a halal feast—in your kitchen, on your balcony, your own social gathering venue. No party would be complete without your halal bbq dishes that are sizzling, tender, and dripping with sauce and lots of flavour. All the halal bbq ingredients and tools you need? 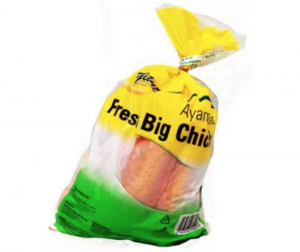 They’re all found at Giant’s huge section dedicated to halal food and products in all Giant stores. You can buy them online, too! Say you want Grilled Aloha Chicken (recipe here). Let’s then get your ingredients, shall we? How about halal canola oil? Check. And your halal thick soy sauce? Check. See? Now it’s more convenient for you to whip up a halal bbq feast! Don’t forget to sign up for the Giant Super Savers Club and be one of the thousands who have reaped rewards and benefited from exclusive halal deals and promotions! Shopping for halal food in Singapore? You have a lot of options! Craving for buns and baos? Get your dose of halal dimsum from these restaurants in Singapore.